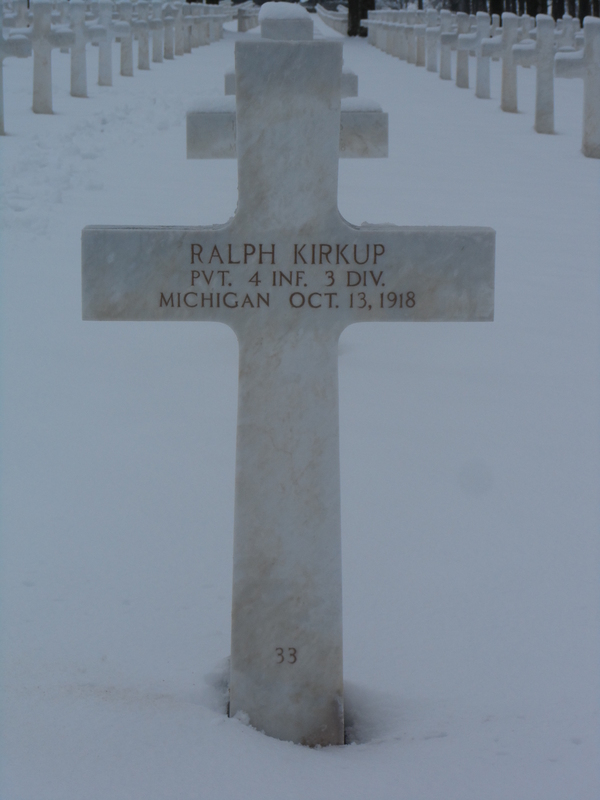 Private Ralph Kirkup, 4th Infantry Regiment, 5th Infantry Brigade, 3rd Infantry Division, American Expeditionary Force died 13 October 1918 and is buried at Meuse-Argonne American Military Cemetery, Romagne-sous-Montfaucon, Department de la Meuse, Lorraine, France. He was 27 years old and is commemorated on the Cockfield War Memorial. In 1891, the family lived at Cockfield and John worked as a coal miner [blacksmith]. By 1901, the family is recorded as living at Main Street, Cockfield and John was employed as a coal miner [hewer]. 1905: Ralph Kirkup aged 14, is recorded as arriving in the USA. November 1906: Ralph Kirkup aged 15, arrived at Portal, North Dakota, USA. 5 June 1917: Ralph Kirkup registered to serve with the US Armed Forces. At this time, he was 26 years old, single and lived at South Bayne, Bayne City, Michigan. He worked as a labourer for W.H. White. It is recorded that he was tall, of stout build, had grey eyes and brown hair. A press article in the Cherlevoix County Herald dated 21 June 1917 reported that 48 men from Charlevoix County were drafted and going to Camp Custer. 23 July 1918: 2981964 Private R. Kirkup, D Company, 340th Infantry, 85th Division embarked upon the commercial steamer, “Corinthic” at the port of Hoboken, New Jersey. His brother Harry Kirkup, 8946 102A Ave., Edmonton, Alberta, Canada is recorded as his next of kin. Upon arrival in France, it appears that drafts were organised into reinforcements for Divisions already in action. Private R. Kirkup was posted to the 4th Infantry Regiment, 5th Infantry Brigade, Third Infantry Division. 12 – 16 September 1918: The St. Mihiel Offensive. “On September 4, the division proceeded to the Vauculeurs area preparatory to taking part in the St. Mihiel Offensive. In this operation it was in the reserve of the 4th Army Corps. The Meuse-Argonne Offensive started on September 26. The division passed into the 5th Army Corps on September 29, and on September 30 relieved the 79th Division in front line. On October 12 it passed into the 3rd Army Corps. For 27 days the division was continuously in front line during which period it advanced 7 kilometers against organized defences, encountering particularly strong resistance in taking Bois de Cunel and Hill 299. The division was relieved on October 27 by the 5th Division and proceeded to the Tannois rest area. 13 October 1918: Private Ralph Kirkup died. It is likely that he died in the early hours of the Divisions entry into action of the Meuse-Argonne Offensive. He was 27 years old. A total of 9,469, 982 Americans would serve during the war: the US suffered 116,516 deaths and another 204,002 casualties. 53,402 were battle deaths and more than 63,000 deaths were categorized as “other deaths”. 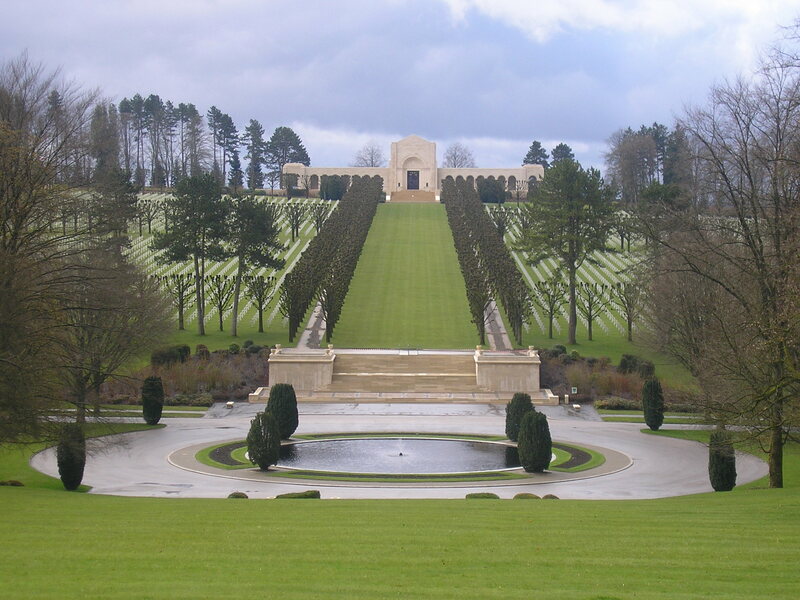 2981964 Private Ralph Kirkup is buried at Meuse-Argonne American Military Cemetery and Memorial, Romagne-sous-Montfaucon, Department de la Meuse, Lorraine, France. 2981964 Private Ralph Kirkup is commemorated on the Cockfield War Memorial. Ralph’s younger brother Gilbert served with the Canadian Expeditionary Force. 13 April 1916: Gilbert Walker Kirkup lived at Armstrong, British Columbia, Canada and enlisted into the 196 O/S Battalion, Western Universities aged 17 years 11 months when a High School student, attending the School Cadet Corps. He was allocated the regimental number 911832, entered France in April 1917, was posted to the CEF Machine Gun Brigade and was promoted to the rank of sergeant. He was discharged 22 April 1919. “The American Expeditionary Force in World War 1: The Rock of the Marne” MA thesis East Tennessee State University May 2008 Stephen Coode p.66 & 67. The other deaths were from influenza [Spanish Flu].